Gloucester’s most prolific poet still going strong at 80 He’s published 19 collections containing more than 400 poems including his most recent offering POEMS: Pilgrimage to Discover Dylan Thomas”, a literary tribute to his favourite poet containing poems written and lovingly cared for over more than half a century. 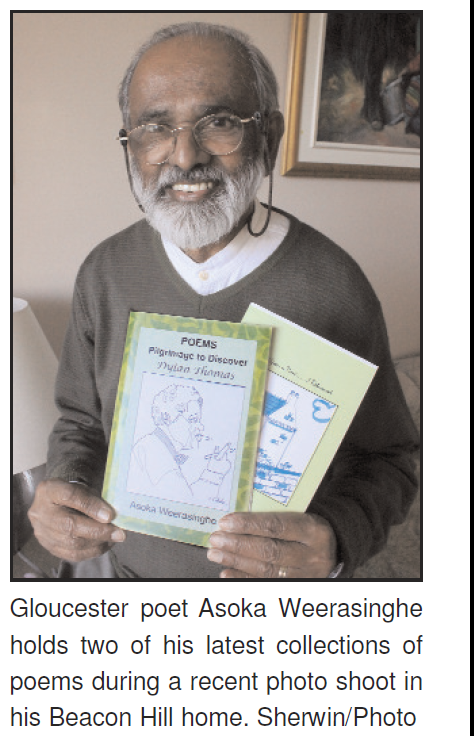 Asoka Weerasinghe is Gloucester’s poet emeritus. By his own unofficial” count, he’s written more than 800 poems, most of which are resting in suspended respite in file boxes, scrap books and desk drawers in his slightly” – note the sarcasm – cramped basement, watched over by a collection of wooden masks he’s picked up during his biennial sojourns to his native Sri Lanka. Weerasinghe’s love affair with the written word was first sparked as a young public school student growing up in the Sri Lankan capital of Colombo. After graduating from secondary school, Weerasinghe left Sri Lanka in 1956 to study geology in London, England. By day, he worked as a clerk for the London County Council, which paid for part of his university studies. After five years he graduated and started looking for a job. One day while job hunting he bought a science magazine and saw an ad in the back for a petrology technician position at Swansea University in Wales. He took an overnight commuter train to the school expecting to be interviewed for the job. Instead, he was given some advice to apply for a scholarship to continue his studies in geology. Prof. Frank Rhodes said to me, ‘We decided not to hire you for the job, because if we did you would not be able to accomplish your dream to become a geologist’. So what you should do is apply for the London County Council’s Major County Award for University Studies and put Swansea at the top of your list for colleges,” recalls Asoka, who ended up getting accepted into Swansea which also happens to be the birthplace of his favourite poet. During his free time, Weerasinghe visited Thomas’ old haunts, including the boathouse and pubs in nearby Laugharne where Thomas wrote many of his poems. It was also in Swansea that Asoka met one of Thomas’ closest associates, poet Vernon Watkins, who read several of his poems and gave him an important piece of advice. He said if I ever lose the mechanics of writing poetry I should read Yeates, because is one of the most technically brilliant poets there is and he was right,” says Weerasinghe. After graduating from Swansea in 1967, he moved to Newfoundland where he completed his Masters Degree in geology at Memorial University and met his wife Jeannie at one of his poetry readings on the campus. The couple eventually moved to Ottawa in 1970 where Weerasinghe was hired by the National Museums Corp. as the head of thematic research to create 15 brand new exhibition halls at the Victoria Memorial Museum in Ottawa. That eventually led him to the Department of Fisheries and Oceans where enjoyed a 20-year career. Through it all, Weerasinghe’s love affair with Dylan Thomas’ poetry never waned. If anything it grew stronger. During a pilgrimage to Dylan Thomas’s Swansea birthhouse in January 2012, he met the curator Annie Haden which resulted in Weerasinghe being invited to return as Poet-in-Residence during the Dylan Thomas Sung and Word Festival later that fall. That was the biggest honour I’ve ever had as a poet. It was the pinnacle for me. I actually got to sleep in his room for five days,” says Weerasinghe. He returned there again last fall to take part in the centennial celebration of Thomas’ birth. He put together and published Pilgrimage to Discover Dylan Thomas” as a centenary tribute to his favourite poet. HEY ASOKA !! SO HAPPY TO LEARN OF YOUR BRILLIANT SUCCESSES. IF WRITING BE YOUR GUIDING LIGHT TO THE HALLMARK OF LITERATI, “WRITE ON” INCESSANTLY. REGARDS. Susantha. May you live long and prosper, Asoka. Thank you for all the good you have been doing for SL.